Zurich, Geneva, and Lucerne are easy on the eyes, but Switzerland’s true appeal lies in the more remote reaches of this small, mountainous country. There are dozens of adorable villages throughout Switzerland, many of them set against the towering Alps or alongside tranquil lakes, matching your Heidi fantasies perfectly. To pile on the charm even further, some of the villages are so isolated that the only way to reach them is by mountain train, cable car, or on foot — but the sceneries awaiting you are well worth putting in the effort get there. Experience Switzerland beyond its slick cities and fancy ski resorts by checking out these seven adorable villages. Despite the village’s ease of access (the train from Lucerne takes under three hours), and sheer Instagrammability, Lauterbrunnen still maintains all the charm you’d expect from a Swiss village. 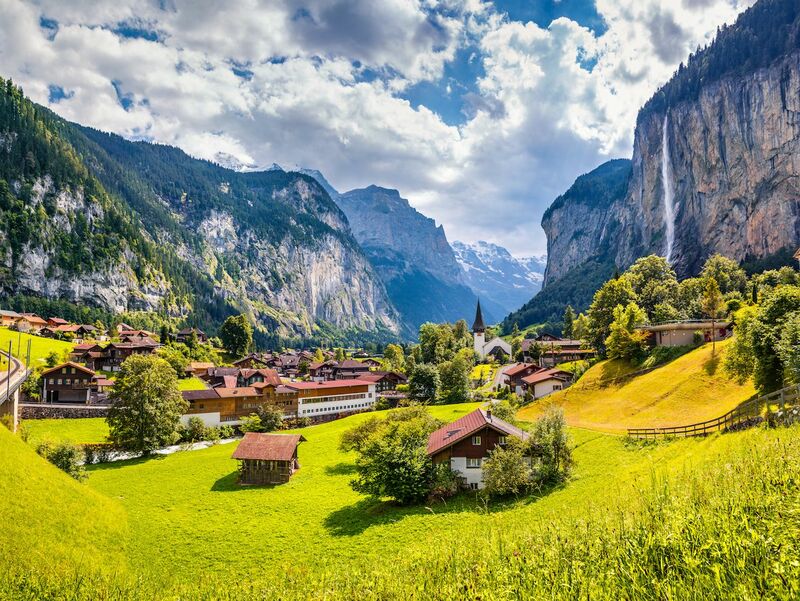 The village is set in the Lauterbrunnen Valley, which is surrounded by steep rocky cliffs, occasionally interrupted by dramatic glacial waterfalls. On a clear day you can see the summit of the famous Jungfrau mountain, and when the conditions are right you’ll hear the terrifying flap of wingsuits above you — it’s one of the world’s most revered BASE jumping destinations. It may be one of Switzerland’s more touristy villages, but with a single main road, only a few dozen buildings, a single grocery store, and mind-boggling scenery, it’s definitely worth the inclusion on any Swiss itinerary. Gimmelwald is located on a small patch of land high up on a mountain, at the far end of the Lauterbrunnen Valley. 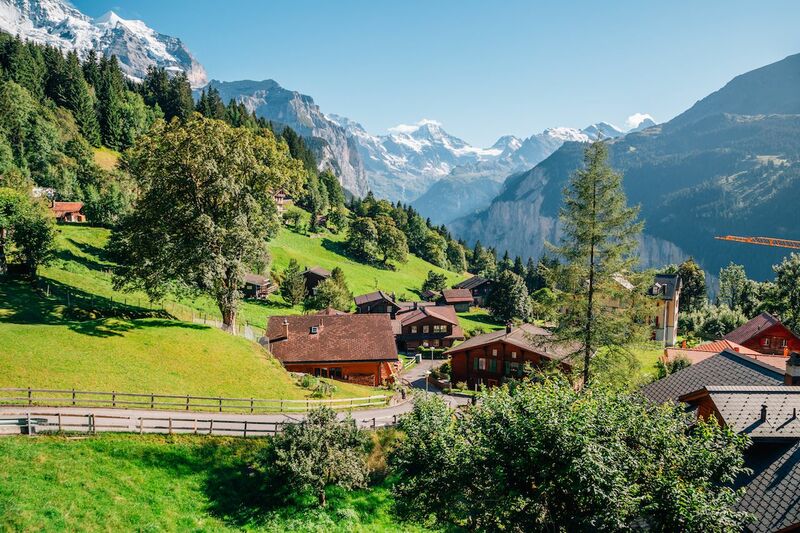 The village is so small and isolated that its population of approximately of 130 typically has to take a wander down the mountain to Lauterbrunnen for schooling and groceries. The tiny village has everything you’d want in a remote Swiss village — clanging cowbells, the odd herd of bleating goats, Alpine views, and a friendly community that’s happy to show off its unspoiled wonderland. 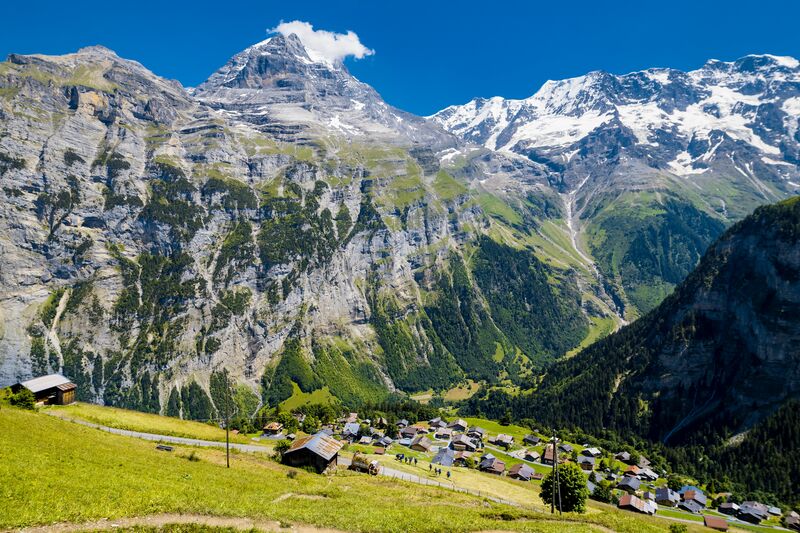 Gimmelwald is car-free by necessity — there are no roads up the steep cliffs to the village. To reach it, you’ll need to walk, or catch a bus to the top of the Lauterbrunnen Valley, and then hop aboard the gondola that makes its way up the mountain. 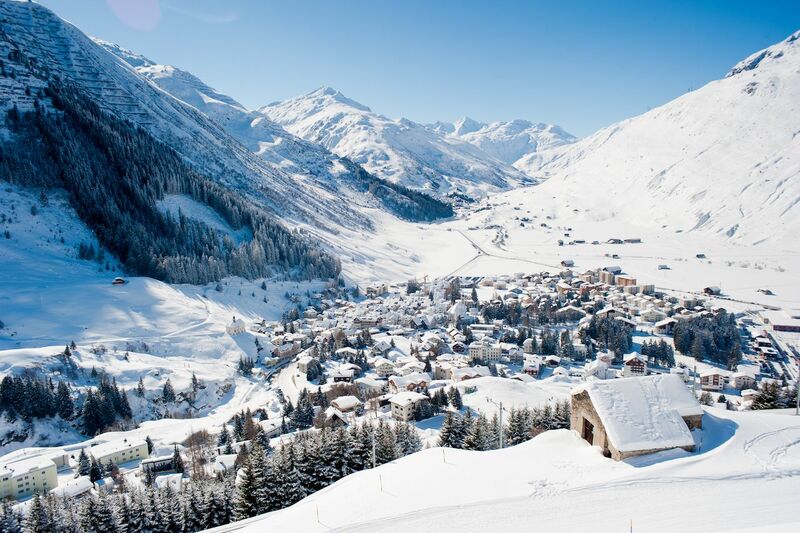 At an altitude of just below 5,000 feet, the village of Andermatt is the ideal destination for skiers in winter, and the perfect hiking base in summer. It’s the largest of three villages in the Ursern Valley, and at the crossroads of Switzerland’s north-south and east-west mountain passes, and yet it’s anything but bustling. Andermatt’s village center is all about cobbled streets, fluttering flags, and steep-pitched roofs, making it a textbook Swiss village. Because it’s located on the country’s most scenic train line, the Glacier Express, it’s the ideal pitstop as you chug between Zermatt and St. Moritz. 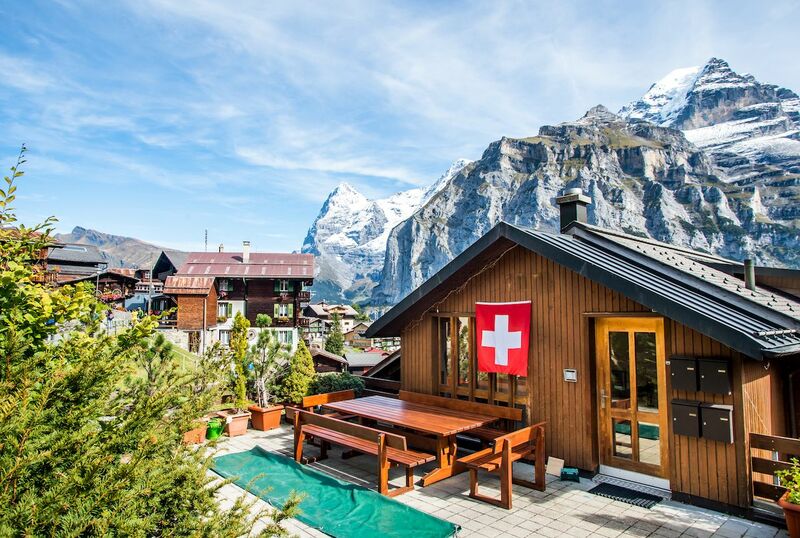 Wengen is relatively close to the capital city of Bern and yet it feels far away from any kind of urban reality. The town is somewhat touristy — it’s a popular waypoint on the way to the Jungfrau’s summit. But like so many villages in the region, it has maintained a careful balance between kitsch and authentically Swiss, helped in no small part by its phenomenal mountain views, including of the famous Eiger. 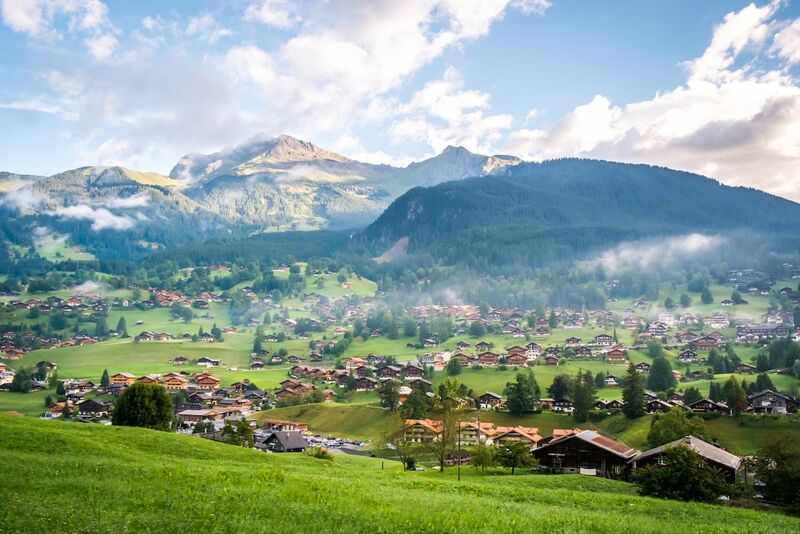 The village is beautiful year-round; in winter the snowfall in Wengen is abundant, but come summer, only the highest peaks retain a dusting of snow, serving as the perfect contrast to deep blue skies and emerald pastures. Mürren is a tiny mountain village located at the foot of the iconic Schilthorn Peak, famous for its role in 1969’s James Bond movie On Her Majesty’s Secret Service. From Mürren, there are dozens of hiking trails across a range of difficulties that serve up some of the best views in the Alps. But if you want to stay put, the village also a great place to unplug and chill — smoke billows quietly from nearby chimneys, and clanging cowbells drift over the village and down the steep mountainsides, uninterrupted by the noise of motorized transport. With no vehicular access to Mürren, the only viable transport option is a cable car, or a grueling hike from the Lauterbrunnen Valley floor, which will leave you feeling blissfully far from any kind of modern civilization. The scenery surrounding the village is the stuff of postcards, and is perfect for the outdoorsy types in both winter and summer. 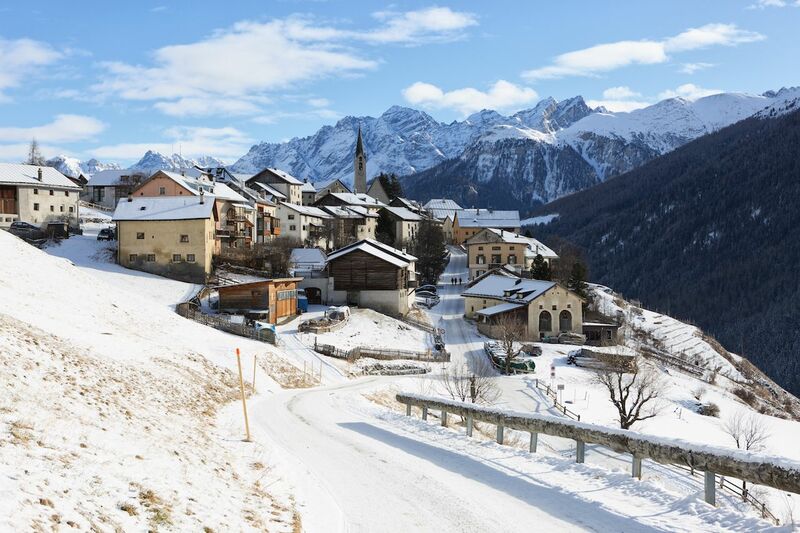 But it’s the beautifully maintained traditional Engadine houses, that residents still decorate with pride, that make this one of the most adorable villages in the country. Once a busy village on the route between Lake Como and Innsbruck, these days it’s the perfect spot for some peace and quiet, with the majority of traffic now using more accessible routes on the valley floor. Grindelwald is a popular resort village located 3,392 feet above sea level in the Bernese Alps. In the winter, skiers and snowboarders tear it up on the various slopes, and then head to the town’s bars and restaurants for lively après-ski. In the summer, it’s somewhat more relaxed, with hikers using the village as a base from which to explore the nearby mountain peaks. The scenery surrounding the village is what you’d expect from these parts, and easy accessibility by road and railway makes it a popular inclusion in the itineraries of the world’s wealthier travelers. Although this may have impacted its charm — the village’s population has grown steadily over the years — Grindelwald is still a pretty, if slightly polished, village worthy of your Swiss francs.